It’s the holiday season – but it could be graduation or a birthday or any other special occasion – and you want to give someone a guitar. Where to start? In this post I’m going to give some advice what size of guitar to buy, the type of guitar (acoustic or electric), how much to pay and whether to buy new or used and local or online. The assumption I am making is that this is a gift for a beginning guitarist and that price is important. If you are a guitarist you might be in a better position to pick a decent guitar for a beginner. But even guitarists can run in to difficulties in making the right choice. I’ve bought guitars for each of my two children and both times I’ve come to realize I had not picked the guitars wisely – though I had been quite proud of my choices at the time. Size of guitar? This depends on the age and size of guitarist. If you are buying the guitar for someone who is young and small or who has reached their adult size and is naturally small, you might want to consider a smaller scaled guitar than is standard. There are actually two independent size considerations. The first is scale length. The scale length of the guitar should be matched to the size of the players hands. The scale length, for non-guitarist gift givers who aren’t familiar with guitar terms, is the length of the strings between the two ends (nut is at one end of the fingerboard and the bridge and saddle are on the body). Someone with small hands and short fingers will probably be happier with a short scale instrument. The body style and size of the guitar, particularly for acoustic instruments, can also be matched to the players physical size. Dreadnoughts and Jumbos are probably going to be uncomfortable to hold and play for someone who isn’t tall. A challenge you may face is if your intended recipient of this gift is, young, small and determined to play a full scale dreadnought just like his or her favorite musician. I can’t solve all your problems. Learning guitar will be easier if the instrument fits. But many musicians have started with instruments that weren’t a perfect fit and adapted their playing to the instrument. One of the mistakes I made was purchasing a short-scaled guitar for my son. It was only a short time before he had a growth spurt and wanted a standard sized instrument. So beware that the best sized guitar for a growing child may not be the one that immediately fits. 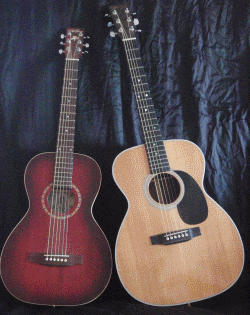 Acoustic or Electric guitar? There is a school of thought among some guitar educators that beginning students should always start on an electric guitar. The action on an electric guitar (height of the strings above the frets) can easily be set quite low. Also, you can buy very light gauge strings for electric guitars. The advantage for beginners is that low action and light gauge strings make it very easy to fret chords and to play for longer periods of time without having painful finger tips. One of the biggest reasons beginners give up on guitar, according to these educators, is because painful fingertips prevents the player from playing long and eventually drives them away from practicing at all. Also, certain chords are very difficult for beginners (bar chords – aka barre chords). It requires some strength to play these chords. Guitarists eventually build up strength in their fingers and calluses on the tips so they can play without pain. However, a bad initial experience might cause a beginner to quit before they develop the required strength and calluses. I started playing guitar on an acoustic guitar. It had heavy strings compared to what is common today and the action was terrible. I sometimes wonder how much quicker I would have learned or how much better I would have become if I had started on a decent instrument. Never-the-less, though I play both acoustic and electric guitar, so much of my style grew out of playing that acoustic that I’m still partial to it and am unwilling to tell you to rule out giving an acoustic guitar. The good news if you want to give an acoustic guitar is there is a much larger selection of well made, moderately priced acoustic guitars available now than when I started playing. You should be able to find a guitar with good action and you can now get lighter gauge strings than I had 50 years ago. Note however that the action on an acoustic guitar cannot be set as low as on an electric guitar and light gauge acoustic strings are not as light as the lightest gauge electric strings. New or used? It is becoming harder to find used instruments at local shops because they are more easily sold on EBay. There is nothing wrong with buying a used instrument. However, I don’t recommend buying a used instrument from EBay or even a new instrument from an online retailer, even though I have affiliate links to online guitar stores on my website. If you are an experienced guitarist or have someone helping you who can tell whether a guitar is properly setup, and if you are an experienced EBay or online shopper, then perhaps you can go ahead. But if you’re not a guitar player – or perhaps a lapsed guitar player – a local store will be able to help and you, and you will be able to see if the specific instrument you buy is in good condition. Let me summarize: Don’t buy from an online merchant unless you really know what you’re doing. Don’t buy a used instrument unless you or someone helping you knows what they’re doing. How much should you pay? Keep in mind this was written in 2010. Check your prices before you buy. Rather than hem and haw around an answer, here’s what I think the minimum you will have to pay. Expect to pay about $200 to $300. You can of course pay more. But be wary of paying much less than $200 unless you or someone helping you knows guitars and can advise you. It may be tempting to buy a more expensive instrument. It’s your choice of course – but consider this cautionary tale. Once upon a time I wanted to give my daughter a guitar for Christmas. I started looking for decent acoustic guitars in the $200 to $300 price range. This was some time ago and there weren’t as many choices as now. Still, I could have purchased a nice Seagull guitar or maybe an Ibanez acoustic in that price range. But I kept bumping up the price I was willing to spend. “If I just pay X much more I can get a much better guitar.” That led to, “If I just pay a bit more I can get a guitar that includes a hard shell case and then I won’t have to buy one separately.” Part of my problem is I love guitars too much and want everyone in my family who wants a guitar to have one as good as mine. I overbought. I ended up giving my daughter a wonderful Martin guitar – one I would have loved to have kept for myself. Sadly my daughter had too many things going on in her life and never learned to play it (she was at college). 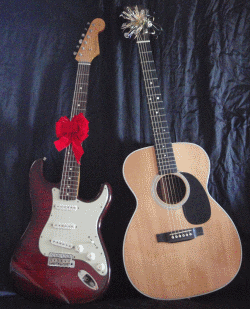 The last I heard, my son had possession of the guitar – so it’s still in the family. But everyone would have been just as happy with the Seagull guitar. Here’s what you can expect to get for that $300. Acoustic guitar: Your $300 will purchase one guitar with strings, free setup (if purchased from a local music store) and maybe some doo-dads such as picks, a string winder or an inexpensive guitar strap. Unfortunately, for this price you will have to buy a case separately. An inexpensive gig bag (a soft case) can be bought for as little as $20 but doesn’t give much protection. A hard shell case (more protection) will cost at least $50 and quite likely will cost $80 or more. Make sure the guitar fits the case. Hard shell cases should fit snuggly so the guitar doesn’t slide or bounce around inside. Electric guitar: You can purchase beginner electric guitars that are fairly decent for as little as $100, but $150 to $200 gives you more choices. It too probably will not include a case. Because solid body guitars aren’t as fragile, a soft case is fine – although it won’t prevent the neck from breaking if the case is dropped the wrong way. Additionally, you will need some way to hear the guitar which generally means a guitar amplifier. That’s another $100 to $150 (approximate minimum range). Add these up and you’re still in the $300 ballpark as the starting point for inexpensive beginner guitars of decent quality. Good luck and happy giving. hi dan! my mom wants to buy an acoustic guitar for my husband for his birthday this summer. i have no idea about guitars at all, but let me tell you a little about my husband, jason. he’s been playing since he was a teenager, and is quite good. he is a multi-instrumentalist, in fact, specializing in guitar, bass, and drums. but he jams daily, even though he currently is not in a band. once upon a time, he took lessons in classical from a bouzouki/classical guitar guru in florida, and he had an acoustic for years, until it was badly damaged by a crazy person and could not be repaired. he mentioned recently he wants to think about getting a new one sometime soon, but i don’t know which direction to steer my mother in. i know nothing about brand names, and i want him to have a great instrument. i doubt mom would spend too much more than $300, though she might be willing to go as high as $400 or $500, if i need to convince her to do so to get a good guitar. should i just suggest a trip to guitar center or somewhere just to look around and see what he gravitates to, or do you have a suggestion of a good guitar he can play on and also maybe use to resurrect his interest in classical guitar? i know he wants to try to get back to classical, but it’s not like that’s going to be his new career. any pointers? Thanks for asking about guitar choices. There are many good guitars in the $300 to $500 price range but as with most items, the more you pay the better the quality. You mentioned both classical guitars and acoustic guitars. Although classical guitars are acoustic, the classical guitar is quite different from a steel string acoustic. It would be good to get an indication from your husband as to which he is interested in. I have been thinking of buying a classical guitar for myself for sometime but over the 40+ years I’ve played guitar, I’ve only owned steel string acoustic and electric guitars. So take my advice regarding classical guitars under advisement. Yamaha classical guitars in the $300 and up price range are reported to be excellent values. Another good brand of classical guitar is LaPatrie, a Canadian company. Among moderately priced steel string acoustic guitars, the Seagull brand is a great value. However, excellent guitars and values can be found from many more brands than I can list here. Perhaps the best thing is to take your husband to a guitar store as you suggested and see what he likes. Good luck.